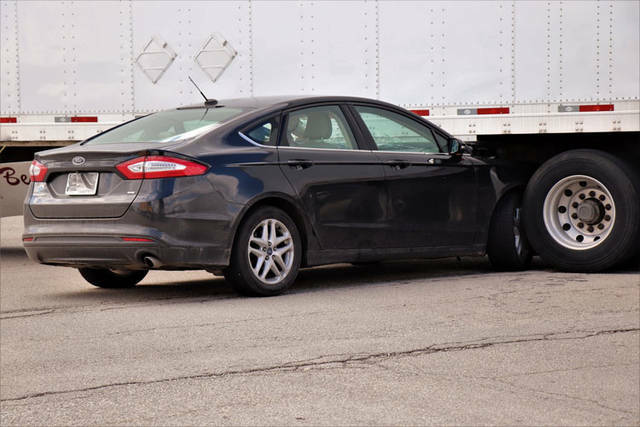 Two vehicles collided, and a Ford Fusion was pinned under the rear driver’s side of a semi trailer on Tuesday afternoon at the intersection of U.S. Route 36 East and State Route 571 . GREENVILLE – An accident involving a semi tractor and trailer versus a car caused the closing of U.S. Route 36 East at State Route 571 for a short time Tuesday afternoon. At shortly after noon, officers from the Greenville City Police Department were dispatched to the intersection of State Route 571 and U.S. Route 36 East to a non-injury accident involving a car under a semi truck and trailer. According to the Greenville Police Department a black Ford Fusion was traveling westbound on U.S. Route 36 when it failed to stop at the traffic light. 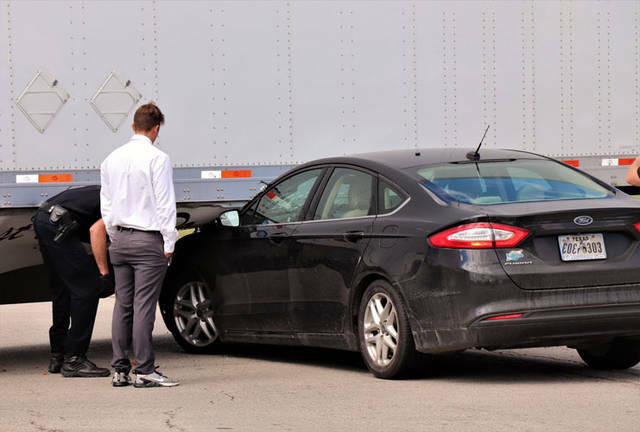 The male driver of the Fusion locked his brakes up at the entrance of the intersection and slid into traffic, causing a collision with a white International tractor and trailer, owned and operated by AYR Express out of Woodstock, New Brunswick, Canada. The International truck and trailer was traveling southbound on U.S. 127, making an attempt to turn eastbound onto U.S. Route 36 when the two vehicles collided, and the Fusion was pinned under the rear driver’s side of the trailer. Drivers of both vehicles were uninjured in the accident, however, the intersection remained closed to westbound traffic while crews worked to clear the accident. The accident remains under investigation by the Greenville City Police Department. This entry was tagged crash, Greenville, Greenville City Police Department, Greenville Police Department. Bookmark the permalink.